Frederick A. Aprim, an author and historian, was inspired by the great Assyrian nationalists, Dr. David Perley, Naoum Faik, Yusif Malek, and others. Fred was born Frederick Aprim Minashe in the city of Kirkuk, north of Iraq, on January 12, 1953 to Aprim Minashe Aprim of Mosul and Gladys Shamuel Adam of Baghdad. His father's parents are Minashe, born in Quchanis, in the Assyrian Hakkari Mountains in southeastern Turkey, and Shoshan of Qarajalu, in northwestern Iran. Fred's grandparents from his mother's side are Shamuel and Nanajan of Diza near Urmia, northwestern Iran. Fred grew up in Arrapha and later moved to Almas, two predominantly Assyrian districts before the mass exodus of the Assyrians during the 1970's began. His father was one of three Assyrians (along with John Aziz and Esha Barcham) who established the first Assyrian Relief Committee (Seeta d’ Udrana d’ Atourayeh) in the early 1950's to help needy Assyrians in Kirkuk, which was associated with the St. George Church of the East in the city. This organization expanded later to cover the regions of Baghdad and Mosul. One of the incidents, which shaped Fred's young life, came in 1969. In that year, his father was arrested along with a dozen Assyrians in Kirkuk, charged wrongfully with treason and the attempt to overthrow the Iraqi government and the establishment of the Assyrian State in north of Iraq. They were scheduled to be executed but the preparation for the return of the exiled Assyrian Patriarch, Mar Eshai Shimun, in 1970 to Iraq, paved the way for their release after weeks of illegal detention, investigation and torture. In 1972, Fred attended Mosul University, College of Engineering and graduated with a B. Sc. Degree in Mechanical Engineering in 1977. Fred's fondest memories and most beautiful days of his life were during his 5-year university studies in Nineveh. His commute to and from his rented room in the al-Dawasa Assyrian district and the university campus every morning, passing by the ancient ruins of Nineveh, Assyria, the walls of the ancient city, and its palaces left a deep impression in his life. He among a group of Assyrians thereafter organized the Assyrian Student Committee, which helped to identify new Assyrian students to the university and introduce them to other Assyrians already there. This Committee, as moderate as it was, organized trips to many Assyrian historical and religious sites throughout the province of Nineveh. The Committee organized various stage plays for the students and for the general Assyrian public in Mosul, including two annual social events. As an athlete, he played volleyball for the Assyrian Athletic Club in Kirkuk, and played for a short period for the Assyrian Cultural Club in Baghdad when he moved to Baghdad in 1977. He was one of the original six players on the college team and the team of Mosul University that won the Iraqi Universities Championship. After graduation, Fred, like every other university graduate in Iraq, was drafted into the Iraqi army. He completed the basic military training in al-Najaf and al-Rasheed Military Camps that lasted for three months. Soon after, he was loaned to the State Establishment for Heavy Machinery and Equipment Repairs as a resident engineer because he was considered Taba’aiya, in a process called “Intidab” (Taba'aiya means: because his grandfather, from his mother side, was born in Urmia, Iran, he could not serve actively in the Iraqi Army, since he was considered a foreigner) His service ended after 1½ years and he received his official military release in 1979 and was subsequently employed at the same company as a mechanical engineer, but now only as a civilian. In August of 1980, he submitted a request for vacation and during the second week of September, traveled to Germany to visit old friends, who had left Iraq previously. On September 22, 1980, while still on his vacation, news came from home that the Iraq-Iran War had started. He decided to stay after a consultation with the rest of the family. After three months stay in Germany, he traveled to Egypt to join his family that had also left Iraq. Fred and his adult sisters had to stay behind in Cairo for six months while their parents entered the U.S.A. to complete their immigration documents with the United States Embassy. Three days before Christmas 1981, Fred entered the United States as a legal resident and lived in the San Francisco/San Jose Greater Bay Area. In 1987, he became a proud U.S. Citizen. Fred faced the common struggle of every new immigrant to a new foreign country and had a difficult time finding a job as an engineer in the United States. He finally succeeded in securing a position working at the Research and Development department at IBM. This position opened the doors for better opportunities in the coming future. He was employed as a production supervisor for 12 years in a production company producing hard disks for memory applications. Soon after he was hired as an engineer with Seagate Technology, a producer of media memory and disk drives. In 1998, he decided to switch careers and pursued self employment. Fred’s hobbies include sports, traveling and writing. He has traveled to Australia, New Zealand and to Brazil in South America. Fred toured Mexico, Canada, and the United States in North America. He visited Egypt and Morocco in Africa and Jordan, Syria, Lebanon and of course Iraq in the Middle East (Asia Minor). He spent several months in Europe touring Austria, Germany, Switzerland, Holland, Sweden, Norway, France, Italy, Spain, Portugal, Greece, and England. His dream trip is the one he is looking forward to which will include India and China. Poetry was always an essential part of Fred’s life. He began writing while in college mainly in Aramaic (Syriac) and Arabic, and wrote articles in English after his arrival to the United States. In his writing, Fred always tries to show that a man’s love for a woman cannot be separated from his love for his mother Assyria, the Assyrian homeland. The Iraqi invasion of Kuwait and the aftermath of that war changed Fred’s life completely. His two weeks visit to Jordan in 1991 after the influx of the Assyrian refugees to that country and witnessing an immigration tragedy in progress changed his life forever. He began his personal quest and deep search for answers and began compiling books for his small library containing some 500 books in addition to magazines, articles, and video tapes. He joined the ‘Assyrian Aid Society of America’ the moment he discovered its inception as an attempt to help Assyrian people. When the Census 2000 in the United States became public, he realized that the challenges of Assyrians are deeper than he had ever imagined. Fred began writing his articles about Assyrian history and what it meant to say that someone was 'Nestorian,' 'Chaldean,' 'Jacobite,' or 'Sur-yan.' He posted hundreds of messages on various websites and forums in an attempt to educate his fellow Assyrians. Fred’s core belief evolves around the message that the Aramaic-speaking Christian people of Iraq, Turkey, Syria, and Iran are ethnically and nationally Assyrians, but were known through their religious denominations, i.e. ‘Nestorians,’ ‘Chaldeans,’ and ‘Jacobites’. This was due to a couple of reasons; religion which played and is still playing a pivotal role in our lives; and ignorance, inflicted upon the Assyrian people because of hundreds of years of cultural, religious and ethnic oppression by the republics currently occupying the indigenous Assyrian homelands in the Middle East. Fred's numerous articles (see below) are prominently published on Nineveh Online (www.nineveh.com), Zinda Magazine (www.zindamagazine.com), and Atour: The State of Assyria (www.atour.com) websites. 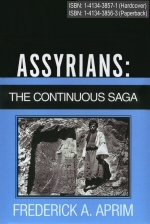 A compilation of these articles including years of academic research has been newly published in his comprehensive and monumental book titled, “Assyrians: The Continuous Saga”. The book is an important reference book for Assyrians and researchers, focusing on the continued existence of the Assyrians. 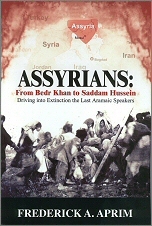 In 2006, Fred's second published book titled, "Assyrians: From Bedr Khan to Saddam Hussein", detailed the numerous massacres against the Assyrians during the Assyrian Holocaust, in hopes of preventing the extinction of the last Aramaic-speaking people in the Middle East. 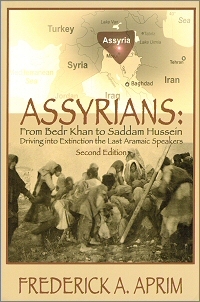 In 2007, the highly anticipated third published book titled "Assyrians: From Bedr Khan to Saddam Hussein, Second Edition" was updated with more references, printed in a clear, easy-to-view format and included additional maps and high-quality photographs. The book is an important reference book for Assyrians and researchers, focusing on the tragic plight of the Assyrians in the Middle East. Frederick Aprim currently resides in the San Francisco/San Jose Bay Area and is actively involved in the Assyrian communities, both in the Diaspora and in Beth-Nahren, Assyria. Politics vs. Academics: Vision for Better Future or Jeopardizing a Glorious History?